John Wayne was a great many things: larger than life, charismatic, an icon. But was he a great actor? His Academy Award win for his performance as Marshall Rooster Cogburn in True Grit is often seen as acknowledgement of a long career as the ultimate cowboy rather than for his performance. Wayne’s presence in True Grit is much like the film itself: diverting without being deep. The drunken Cogburn is hired by hot-headed teenager Mattie Ross (Kim Darby) to hunt down Tom Chaney (Jeff Corey), the man who killed Mattie’s father. They are joined by a Texas ranger named LaBoeuf (Glen Campbell) who is after Chaney for other crimes. Wayne isn’t particularly noteworthy in his performance. He just does his drawling ‘John Wayne’ thing, but for any Western fan, that’s more than enough. Campbell is appropriately cocky, and raises a few laughs, but Darby gives the best performance. The gutsiness she invests in Mattie helps overcome the fact that the actress is clearly in her early 20s. The three exchange Marguerite Roberts’ witty dialogue, frequently making light of each other’s age/youth/attitude. They are ably supported by Corey and a young Robert Duvall as bandit gang leader Ned Pepper (Also, keep an eye out for a young Dennis Hopper in an early role). For all the pleasantness of True Grit’s wit, it also serves highlights the shortcomings of the film. Despite having garnered a reputation as a near-classic of the Western genre, there is little to distinguish it from other Westerns of the period. Henry Hathaway fills the picture with beautiful images of the rugged American midwest, but there’s little in the way of edginess. Elmer Bernstein’s score is reminiscent of his own score for The Magnificent Seven, and the overall tone of the film is adventurous and bright. 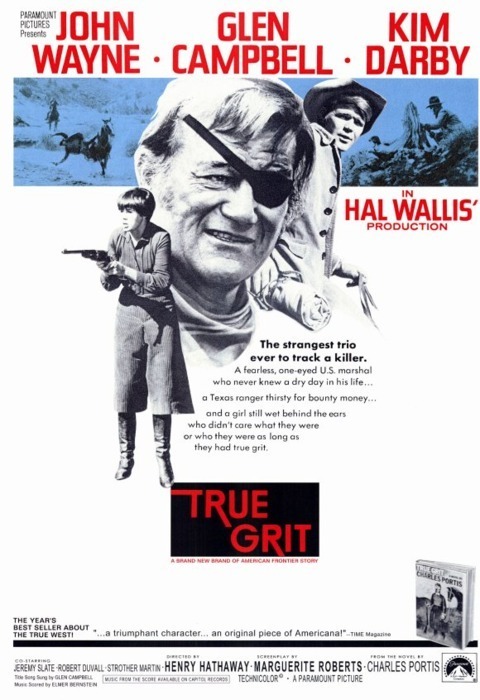 For lack of a better word, True Grit lacks grit. Whilst there are shootings and deaths aplenty in the film, it’s the relationships between the three leads that are the focus. True Grit is no mythbuster; it boils down to a pseudo-sitcom setup of a drunk, a cocky ranger and a headstrong tomboy forced together. It’s undeniably entertaining, but that title is a case of flagrant false advertising.